Salads in the middle of winter sometimes leave me cold. I know, a fresh salad can invoke thoughts of springtime and sunshine. But there are days when you crave comfort food and I have never gotten myself to believe salad is comfort food. Power to you if you’ve done that! Anyway, that was my inspiration for this recipe. I wanted my veggies, but I wanted them warm and cozy! Boil the water with the quinoa in it, then reduce to a simmer for about 20 minutes or until the water absorbs. Meanwhile, heat the coconut oil on the stovetop using a med/high heat. Add the garlic and onion, the Brussels sprouts and carrots. When these are starting to soften, add the peppers. Keep the heat at least at medium so you get some browning of the veggies. They are done when you say they are! If you want more crunch, cook less. Combine these in a small jar and shake. Adjust the mustard and vinegar to taste. If it’s too tart for you, add olive oil. 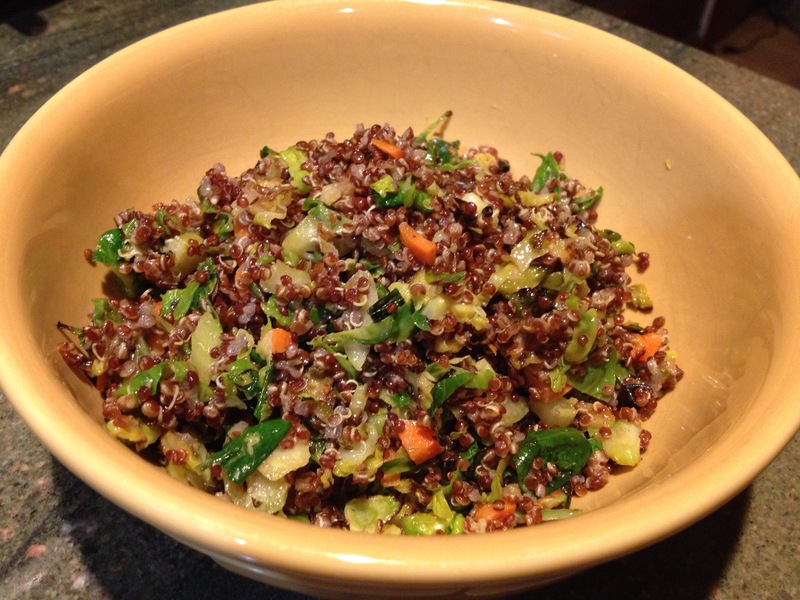 To serve: combine the quinoa and the vegetables. Drizzle with dressing to taste! I hope this satisfies your winter comfort food craving in a healthy way!